Crossing the finish line in 42 hours, 30 minutes after running 135 miles across blazing hot Death Valley was not a record setting time for me. The iconic Badwater ultramarathon starts at the Badwater basin, the lowest elevation in North America at 282 feet below sea level, and now officially ends at the 8,360-foot Whitney Portal trailhead on the mountain. At the 2015 AdventureCORPS Nutrimatix BADWATER®135 race, I did set a record by completing an unrivaled 20th Badwater 135 races. I ran my first Badwater Ultramarathon race in 1990. Why 20 Badwater ultramarathons? The desert is never forgiving, but always welcoming to me. There’s a peace in disconnecting from the everyday, electronic world and instead being connected to the earth, your support crew, and the Badwater family. That’s what has brought me back for so many years. In the field of 68 men and 29 women consisting of extreme sports athletes, adventure racers, ultrarunners, mountaineers, and triathletes who had to compete with their sports credentials and accomplishments just to be invited to the race, at age 64 I was still a competitive applicant. In 2012 I finished the first-ever circumnavigation on foot of Death Valley National Park, about 425 miles in one of the hottest, driest places on earth, during the most blistering month in U.S. history. I rank that expedition, completed with Dave Heckman, as tougher than ascending Mount Everest, but not as challenging as my record-setting transcontinental run of more than 3,000 miles from San Francisco to New York City in 52 days, which was the subject of my memoir, “Running on Empty.” I’ve also completed a fully unaided solo crossing and a 586-mile “quad” run across Death Valley. All told, I’ve crossed Death Valley on foot, in July or August, a record 27 times. I’ve won the race a record four times. 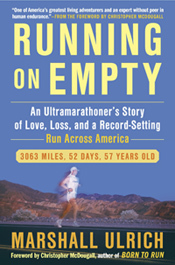 But, I also did not finish (DNF) three times: first in 1994 when I was diagnosed with exercise-induced asthma, in 2000 when I decided to stop at 51 miles (Wild Rose) as I had an adventure race the next week and decided I couldn’t let those teammates down by pushing myself at Badwater; and then again in 2009 when I wasn’t recovered from injuries obtained during my trancon. At the 2015 Badwater Ultramarathon, where the average age of the racers was 46 among the 38 newcomers and 59 veterans from around the world, I placed 63rd of the 97 starters. Eighteen athletes did not finish (DNF) the race. Why such a high DNF rate? For various reasons the race went back to an evening, or PM, start which is the way the race run from 1990 to 1995. While some people thought it would be easier, that wasn’t the case. Higher temperatures at the start, as well as sleep deprivation, especially for those of us that had to run through two nights, really took a toll on a lot of participants. But my race did not stop at the Portals. For every one of my 20 crossings I have completed the 11-mile climb to Mt Whitney’s 14,505-foot summit that is the classic crossing from the lowest to highest points in the continental U.S. This year was no exception. After finishing the Badwater 135, I obtained the necessary Forest Service wilderness permits and summited M t Whitney in a total time of 65 hours from my 8 PM race start on July 28th. 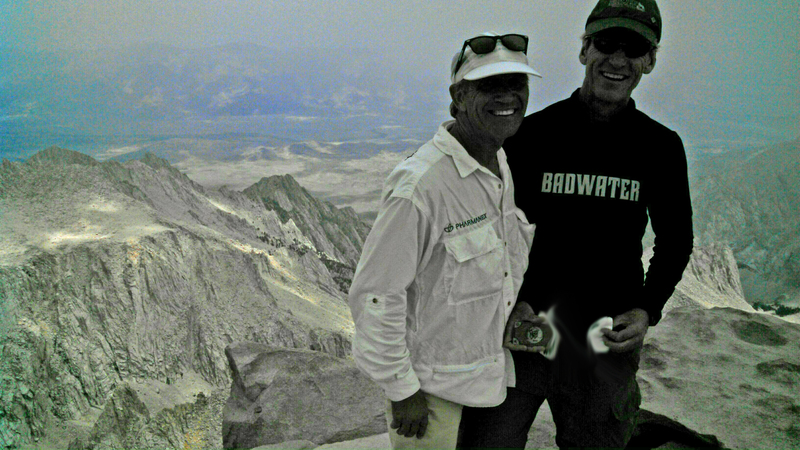 On the top of Mount Whitney with another “Badwater purist,” Danny Westergaard, who also went to the 14,505-foot summit to complete the original Badwater 146 couse (lowest to hightest). My record for the 146 miles from the Badwater basin to the summit of Mt Whitney of 33:54,set in 1991, still stands after 24 years. Why do I always go to the top? For me it’s a matter of honoring the people that came before me. I guess I’m just old fashioned that way. Sadly, only about four people continued to the top, as most runners either don’t know the history or don’t understand the original intent of those that established the lowest to highest route.